The Black Tentacle is a special achievement award. It is handed out at the discretion of The Kitschies' board, which is comprised of editors, authors, marketers and social entrepreneurs. 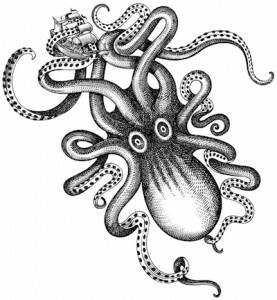 The Black Tentacle is awarded for a work or body of work that does not otherwise fit The Kitschies' criteria. The winner receives a hand-crafted and embroidered tentacle and a bottle of The Kraken's black spiced rum. The winners will be announced on 26th February in a ceremony held in London, at Free Word Centre. Don't mention it, Jared! :) I am looking forward to see the winners. I enjoy awards like this that bring different books to light than the "major" awards. I'm not slighting those awards. Despite the jaded feelings of others and the annual controversies I enjoy the Hugo, Nebula, World Fantasy and Locus awards for what they are. But I enjoy the lists that the Kitschies generates too. I have yet to read any of these but have vN on my tbr pile as gift for Christmas and am looking forward to it after the praise I've read and there are several others including The Folly of the World and Angelmaker that sound like works I would enjoy. The awards that I tend to follow are quite numerous, but only to see their shortlists and winners. There are only a couple of awards, The Kitschies included, that make me want to read all the titles from their shortlists. I managed to keep up with them for a while, but in the past two years my time was a bit limited. However, I do hope to read the shortlists of 2 or 3 awards that I find the most attractive at the moment, The Kitschies, Shirley Jackson Awards and World Fantasy. I might try for British Fantasy Awards too, but I am not sure how they go this year since there is no FantasyCon this year due to the World Fantasy Convention being held in Brighton. I like that all the awards point me to books to at least take a look at, whether or not I end up reading them. And despite all the complaints, it is the controversy of awards that often get folks talking about books that should have been shortlisted, that should have won, etc. and that talk leads to exciting reading discoveries.